Dona Lydia | Product Categories | Vincent & Tampa Cigar Co.
For 85 years the Oliva Tobacco growing family has long been recognized as the pre-eminent tobacco grower and supplier of premium leaf to many of the worlds most esteemed cigar brands. Now new company patriarch John Oliva has set forth to create a cigar that represents the pinnacle of the tobacco growers craft and cigar makers art. The result is the Doña Lydia Cigar. Steeped in rich Cuban tobacco farming traditions, special emphasis was placed on the specially selected tobaccos for the Doña Lydia. 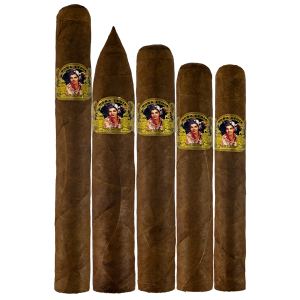 A rich blend of Nicaraguan, Dominican, and Honduran fillers are married together to lend a complex yet balanced smoke. A grade of Connecticut Broadleaf usually reserved for wrapper is used for the binder to harmonize the blend and impart deep sweetness. An aged and slow fermented seventh priming Ecuador Sumatra wrapper known for both its spicy undertones and dark chocolate bouquet swathes the Doña Lydia and represents the apex of the Oliva’s growing expertise. And finally, each cigar is crafted in Nicaragua by the Nicaragua American Cigars S.A. Factory where John Oliva placed paramount importance on producing a cigar of unfailing consistency. The result is a cigar of unparalleled flavor and as beautiful to behold as Mr. Oliva’s wife – the Doña Lydia on the box.